Animal costumes are always a popular choice for Halloween but the Tiny Tiger Child Costume is one of the cutest and most playful cat costumes available. This tiny tiger costume features a plush faux fur dress with an orange and black tiger striped body with black criss cross lacing up the front. The sleeveless dress has black faux fur trim around the neck and hem and has an attached stuffed tail. This tiger costume also includes a matching pair of plush tiger striped legwarmers with black faux fur trim and a cute tiger ear headband. This cat is on the hunt for only one thing – candy! Tigress Halloween costumes can be enhanced by adding simple cat make-up and can be accessorized with black fingerless gloves or a pair of black tights to go out trick or treating. 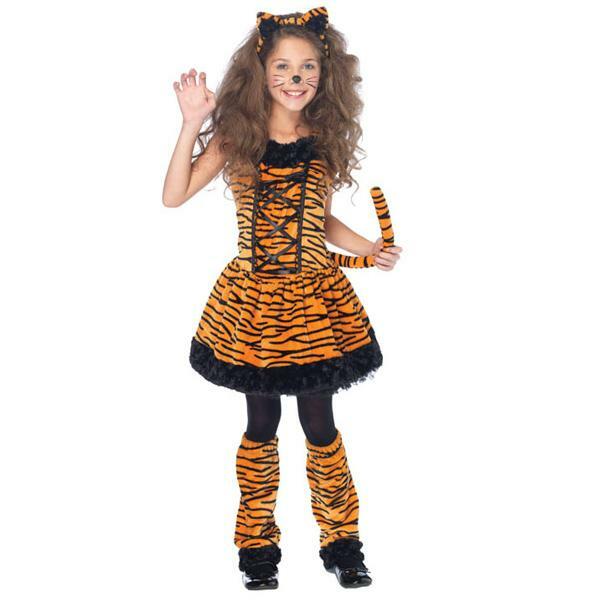 The tiny tiger costume is available in sizes to fit most children up to size 10.